A friend told me there was a blog post about pricing changes. The pricing changes I don't mind--I *want* to support you to make sure you're able to develop the best product possible. However, as with many things (breaches from a few years ago, for example) instead of sending out an email to your customers you put the info on a blog that, frankly, many people probably don't read. I've been with you since nearly the beginning, and this has always irked me. It's gotten to the point that I'm looking into other PW managers (despite the headaches involved), to see how they communicate with their customers. There could be serious breaches or changes afoot, and your response is about as shady as it can be: more like a CYA situation than actually caring about your customers. Disappointing to say the least. 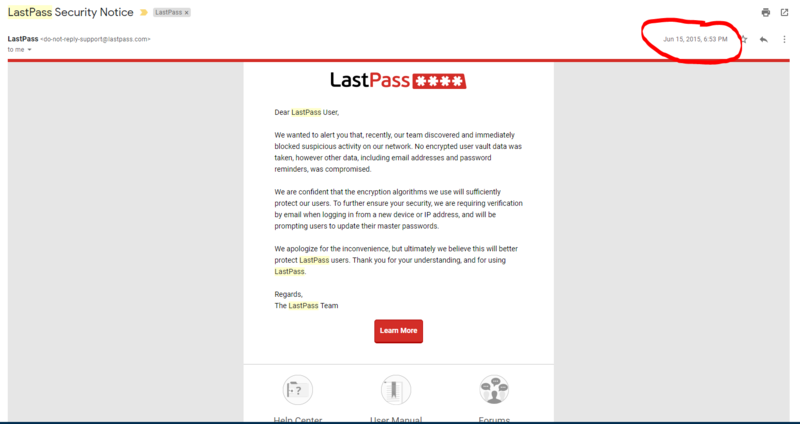 Here's how I found out about the breach: https://krebsonsecurity.com/2015/06/pas ... of-breach/. Not from an email, but from a post somewhere else that directed me to a blog post you had made. Come on, LP. Do better for your customers.